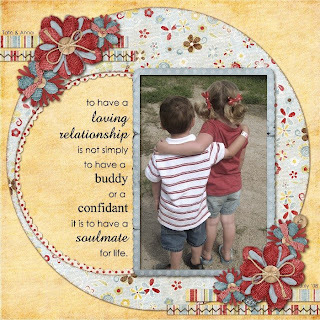 Last night I picked my DigiShopTalk member kit and it was from Shabby Princess. She just has these fabulous free kits on her site, and it me think of her last free release and the pages that my friend Heidi had done with them. Heidi is dear to me for many reasons, one of them is that we are both twins with twins and our twins were born on the same day and the same gestational age - so the twin factor is overwhelming between us. We've never seen each other in person, but her spirit is with me every day. She posted this beautiful picture of her twins from the July 4th holiday, and I had just gotten this wonderful kit & I felt tempted to enter a LO in the DST Featured Designer Contest where you are limited to only the items in the kit. That was a bit of a challenge for me as I'm usually grabbing stuff from everywhere. Heidi is a very talented scrap artist herself, and would probably do this photo more justice than I, but this one's for you Heidi. I modified the photo a bit by adding an aged photo layer and then changing the opacity so that it had a bit of a sepia feel like the papers. Ok, Miss Sarah. I am literally crying right now. This has got to be the SWEETEST thing ever. Thank you so much for doing this. It has completely made my day. And I hope you know I feel the same way about you. You are incredible and I feel so blessed to know you. Thank you again!! Love ya, girl! ohhh sarah! what a beautiful and sweet thing to have done for heidi! it had me tearing up, and it has nothing to do with me LOL LOL! !